Just a quick idea to make your life easier and cleaner! :) I tried two things for dry erase makers and want to share on Holly's Tried It Tuesday! 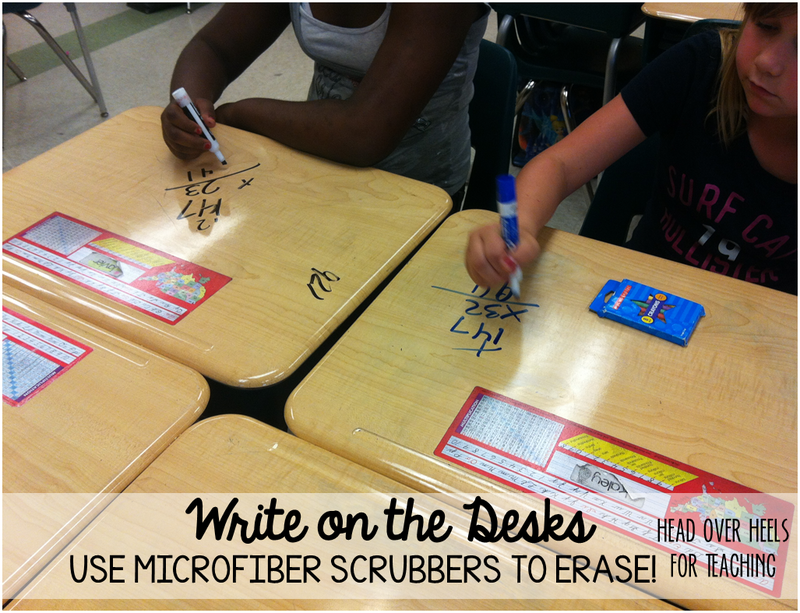 Using these Microfiber Facial Scrubber as erasers for dry erase markers! They are just the right size for students' hands! Small enough to fit in their group tubs! They are colorful! (I assigned a different color to each group member). They leave no mess and can be washed! I love these new erasers! Much cheaper than buying from those companies that sell the dry erase boards! Use them on desks or dry erase boards. These are the perfect erasers! 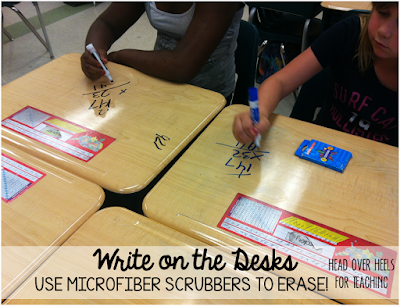 Your kids will love writing on their desks! Such a treat! And, you'll love the easy clean up! Do you have any other ideas for erasers? Love that those scrubbers would easily fit in their pencil pouch... Might get those have the kids carry them with them as a daily supply! Why is it that every time I go to Dollar Tree I forget what I was supposed to buy? This was one of those things. Oh...and fly swatters too from your SWAT post. That just sparked a memory! Thanks! What time do they close? Lol! 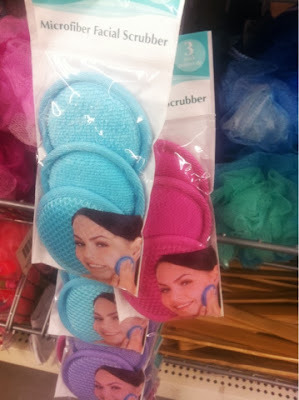 I always wondered if the poms stayed on...I like the idea of the facial scrubs. I like it even more that they're 3 for $1!! Thanks for sharing!! I looked for those at the dollar store, but couldn't find them. I buy bulk packages of washcloths and use those. Couple of times a year I take them home and throw them in the washing machine, and they are good to go! Terrific idea! I saw that pom-pom idea a long time ago, and figured they'd fall off rather quickly. The make-up sponge idea is really cute! For the Pom poms, if you have enough glue they stay on. My babies use them daily and they're still there, HOWEVER, when the marker dries out you have to start over and I just don't have that kind of time. The pads and washcloths and all only work if you have the high gloss desks. If you have tables like me, they don't. However, baby wipes do. We keep a pack at each table and tissues (for multiple things) and for now that works and keeps their surface clean. I tried the pompoms and struggled too; they lasted less than a week! I believe I'll be taking a trip to the Dollar Tree now! 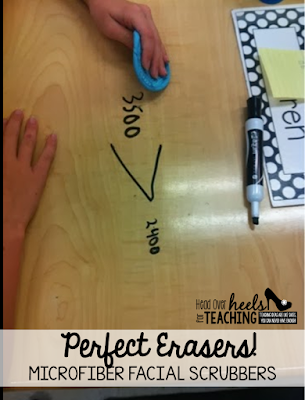 Kids often in the habit of writing on desks due to which they are sometimes punished but it is very important to erase marker's lines from desks and other places of classrooms to make it prettier. The online writing services which you can find http://www.vipessayservice.com/blog/how-to-write-a-college-essay here are available at low cost so that everyone can get it. I tried these pom poms glued on the dry eraser markers, but after just a few days all the pom poms were falling off! Maybe I didn't use enough glue. Wow… Really Appreciate your posting style. As you may have read here whack your boss 2 unblock, in the past six months juegos zoxy, I have become incredibly motox3m2 passionate about handling money with wisdom y 10. I poured my heart and soul earn to die 3 into my most time consuming, and most popular blog post.